Watching the recent films Mary Queen of Scots (2018, screenplay by Beau Willimon, directed by Josie Rourke) and The Favourite (2018, screenplay by Deborah Davis and Tony McNamara, directed by Yorgos Lanthimos) we noticed something odd. To quote one of our favorite lines from Kal Ho Naa Ho (Tomorrow May Never Come, 2003): "It's not okay. It. Is. Not. O. K."
Mary Queen of Scots portrays the deadly struggle for the Scottish throne in the 1560s; The Favourite is about the no-holds-barred contest between Sarah Churchill (Rachel Weisz) and Abigail Hill (Emma Stone) for political and personal influence in the court of Queen Anne in the early 1700s. "Okay" is American slang that first appeared in the mid-19th century, according to the Shorter Oxford English Dictionary. Why single out this particular blunder? After all, both films are filled with historical inaccuracies, fanciful scenes, and (often deliberate) anachronisms. In Mary Queen of Scots there is a final confrontation between Elizabeth I (Margot Robbie) and Mary, when in reality the royal cousins never met. (The Elizabeth-Mary scene is also the dramatic climax of Donizetti's 1835 opera Maria Stuarda, which was based on Friedrich Schiller's 1800 play Maria Stuart.) Mary Queen of Scots also takes a highly indulgent view of Mary's ruthlessness, plus in Lord Darnley it features the kind of despicable gay villain that I thought had been banished from movies around 1980. 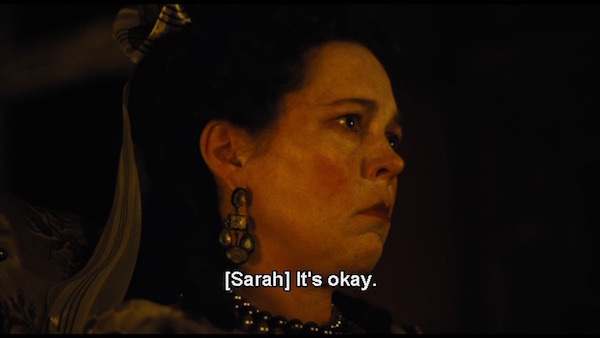 In The Favourite, Sarah dances provocatively with Masham (Joe Alwyn) in front of the queen, and as the scene progresses their moves grow more and more outrageous. The idea is to make their breaches of decorum as shocking to us as they might have been in the 18th century, without having to provide a lot of exposition about the permissible bounds of behavior at court in 1705. But such deliberate anachronisms put invisible quotation marks around the action, and the consequent irony distances us from the characters' dilemmas rather than making them more vivid. I think it's more powerful to try to draw us into the world of the characters, rather than to bring them so obviously into ours, but for some reason the filmmakers neglected to consult me. But the use of "okay" in both films is something different. It's not intended to shock or surprise us, or make the characters seem our contemporaries, or provide a shorthand explanation of antiquated social conventions. It's simply a mistake. In both films the characters could have said "It's all right" with no loss of meaning and a much higher degree of historical verisimilitude. Perhaps next time the filmmakers should ask a librarian.